Ord cottage is a family friendly bungalow set back from the forestry track that runs up Glen Feshie. There is a fenced area around the house and a field running down to the river on the far side of the track. It is ideally located for exploring the Highlands as it is only 5km from the A9 but if you just want to relax it is surrounded by beautiful countryside and there is plenty to do locally. Glen Feshie is a quiet and lovely Highland glen with abundant wildlife, we see red squirrels, deer, osprey and lots of birds are regularly seen from the house. There is excellent mountain biking and walking; canoeing, dinghy sailing and windsurfing on Loch Insh, 1km from cottage and swimming in the river close to the house. Despite being in a quiet location it is only 10km from all the facilities of Aviemore. 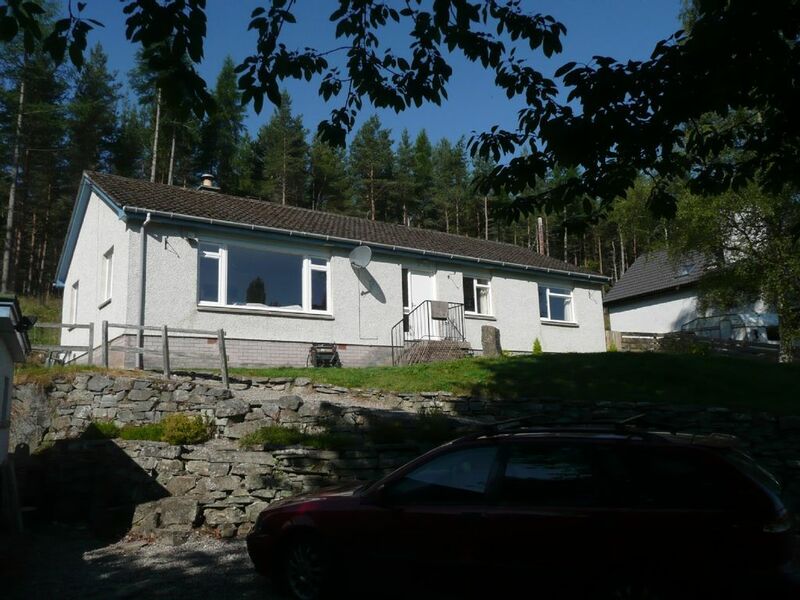 Ord Cottage has 3 bedrooms (1 double, 2 twins) a large sitting room with open fire, a sofa bed and uninterrupted views of the river and glen, a large, very well equipped, newly refurbished kitchen/ dining room, a new bathroom and a shower room with a walk in shower. Part of the garden is fenced and therefore is safe for small children. The house is ideal for families and many have returned, approximately 70% of guests have stayed before. Our aim is to provide family and pet friendly accommodation at a reasonable budget. The bothy is sometimes used by the owner and her family for the weekend, we will not intrude on your holiday as the cottage and it's garden are 2.5m above the bothy. Mountain biking track runs past cottage and watersports are available on Loch Inch 1 miles away. If you have stayed before please text me on 07590 465565 for returning guest's discount. This cottage is ideal for a Winter break, toasty warm and well equipped. It is a semi remote location but that is what attracted us to stay here you will need a car, if you are looking for somewhere to enjoy wildlife and nature and great walks this is the location for you. Alison the owner was easy to contact before our stay and once we arrived she showed us on a map good places to walk and places of interest to visit enabling us to make the most of our visit. I will be returning to this cottage. Ord Cottage is a wonder, incredibly comfortable, well equipped and a beautiful rural location for that family get away with your dog. We loved the cottage we stayed in! Although we were originally supposed to stay in the house next door, the owner moved us to the cottage next door. We loved it!!! Cottage was cozy, clean, and very modern. We would definitely stay there again!!!!! Ron. Unfortunately, can't review this property due to a last minute burst pipe. However, the owner provided us with alternative accommodation at her own adjacent property which was fantastic. Nothing was too much trouble , communication was A1 and location is excellent . Loads of things to do nearby and some great short walks from the property. Nearby water sports centre is a good place to pop in early evening for a drink with great views over the loch. On forestry track, adjacent to River Feshie, about 70m up track from B970 where it crosses the river. Ski: Cairngorm ski area 15km from cottage. Cleaning optional £50, but will be charged if cottage not left as it was found. Price includes all heating and electricity.